On a trip to Denver last year, one of the first dispensaries I went to was Herban Underground on Broadway. Easy entry, clean and well-organized shop front, and friendly faces in store and around the counter made it clear I’d find something good there. In amongst strains I’d heard of before and ones with fantastic names (Death Star, Chiesel), I spied ‘STARDAWG’ and promptly asked to see the jar. I recall the jar being full of purple, almost blue-looking nuggets, dense and fragrant like Chemdawg. Hybrid strains like Stardawg come in incredible variety, as each strain expresses different parts of its parent genes. The batch I sampled was both sour and woodsy. Like others’ have reviewed, I felt a clarity from the sativa that normally can hang heavy in hybrid blends. Clear mind, no racing heart. Absolutely great feeling after just a hit or two, and I was ready blaze trails through the streets of Denver. The nuggets were positively saturated in sparkling trichomes, so I can see where Stardawg gets its name. The main flavors tend to be listed as earthy, or the strong diesel of both Chemdawg 4 and Tres Dawg, but I found a fruitiness in the first hit of a fresh bowl. 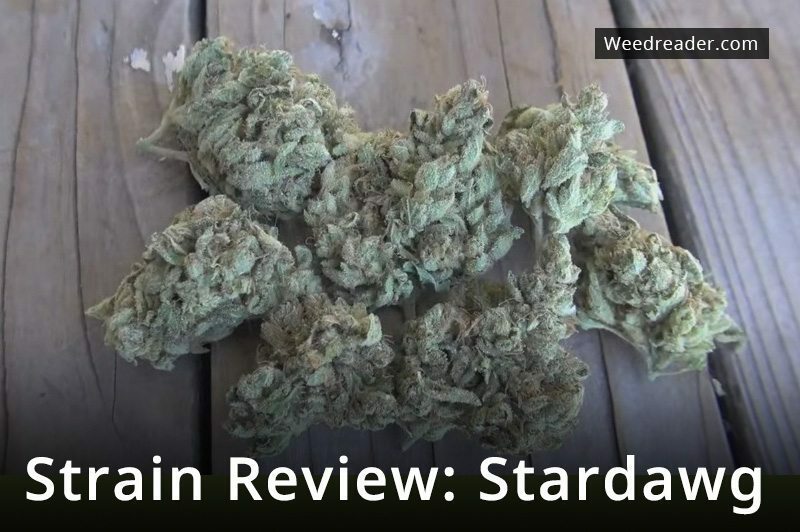 I could feel how extended use of Stardawg would bring on deeper anxiety and tension relief. I felt no restlessness, rather a clear energy that smoothed out aches that normally drag things down. Top notch smoke if you need energy for the activity, then want time and space for a nap. Other folks have said Stardawg enhances their appetite. It also kills nausea, though the initial smell could make you a little faint–especially if your body is low on cannabinoids. The best way to take care of that deficiency? Make some potent cannabis oil (weed needs to be decarboxylated, or activated, so that the THCA turns to psychoactive THC– toast your weed between 220 and 240 degrees F to be sure it’s activated), and make a batch of edibles. As great as smoking is, one of the best ways for your body to process and get benefit from cannabis is to orally consume it. Munch that cookie, eat a brownie, or try something more savory. Just get that weed in your belly!